I’ll admit quite freely that I’m a little tired. Bushed. Knackered, even. Perhaps I’ve let the housework slide a little, and maybe my bedroom floor is like a minefield of shoes and clothes that are not actually dirty but also not quite clean. I’m really lucky, in many respects, because Mister H actually has a whole month off work so I’m not yet on my own. To be honest, I did think that a whole month of him at home would drive me bloody crazy, and I have to admit that he’s been a great help with D Man. Perhaps he contributes to the mess as much as the tidying but we shouldn’t focus on semantics when we’re focusing on day to day care of a toddler, a newborn, a control freak (me) and Leo (him). I’ve been keeping it simple in the kitchen. Mister H has busted out a couple of his signature dishes, and I’ve been grateful for food for the freezer. This mildly spiced chicken is a really simple, fresh and tasty dinner that is also EASY and QUICK. I served it with brown rice and salad, two things that always make me feel as though I’m getting healthier as I chew. You could serve it with baked potato, or white rice if you prefer. I don’t find that the green chilli adds any heat, so D Man is happy to eat this (mind you, the way he eats Kettle Chilli Chips I don’t think heat really phases that little monkey!). Katchumber is like an Indian salsa. It has very similar ingredients to a traditional salsa, but instead of lime you use brown vinegar. It is a real flavour of my childhood. My grandparents were both born in Bombay and family meals with them are often curries served with raita and katchumber. 6 pieces chicken pieces, whatever shape works for you. I used breasts cut in halves this time. Place all chicken ingredients into a food processor and blitz until smooth. 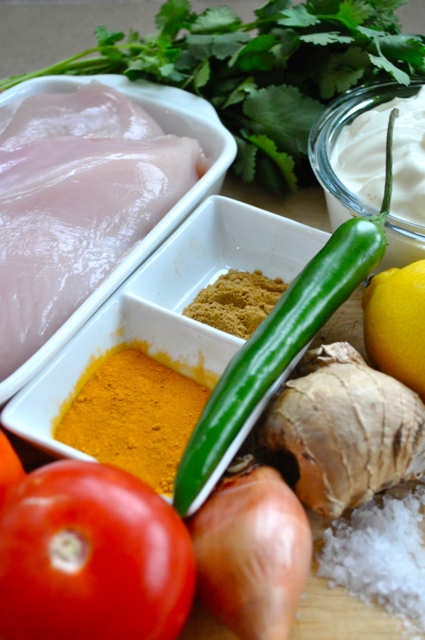 Place chicken into marinade for at least an hour. Cook under a hot grill, or on a bbq for 10 or so minutes. For your katchumber, throw your tomato, onion, coriander and cucumber into a bowl and dress with vinegar and salt. Leave to stand for 15 minutes before serving to flavours can meld. 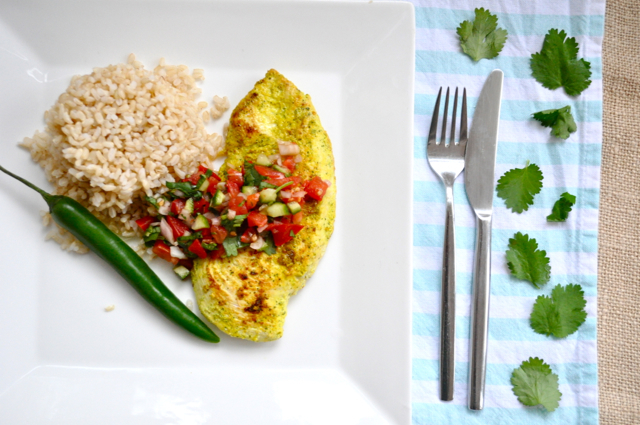 Serve chicken with katchumber, brown rice and salad. Too damn easy! Way too damn healthy. Ensure you eat a large bowl of ice-cream after to compensate.